Top train experts will get into a huddle in future to sort out rail disruptions. 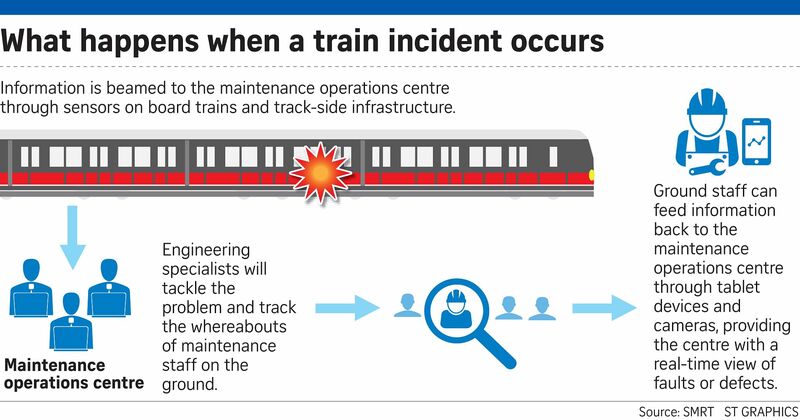 Train operator SMRT has launched an integrated maintenance operations centre (MOC) to coordinate its recovery efforts in the event of disruptions and reduce its response times by about 30 per cent. It has grouped 35 of its best engineers and rail experts at its centre in Bishan Depot and will pump in about $5 million over the next few years, the company said yesterday. Before the operations centre was set up in August, the experts were distributed around the network, said SMRT chief executive Desmond Kuek. The new centre will improve both the timeliness and quality of emergency maintenance response, he added. The centre allows engineers to monitor train movements and staff deployment and it receives a real- time video feed from ground staff. With everything under the same roof, there will be better coordination. During breakdowns and emergencies, timely coordination between parties is very important. "With the MOC, engineering staff in the field are better networked and provided with timely support when resolving complex technical issues on the ground," said SMRT Trains managing director Lee Ling Wee. The centre currently monitors only the East-West and North- South lines, but will soon monitor the Circle Line as well. It will move from Bishan Depot to Kim Chuan Depot, along with SMRT's operations control centre - which oversees the running of the entire train network - from 2017. The Bishan site will remain as a backup, said Mr Lee. The new centre is part of SMRT's measures to boost response time to crises and improve rail reliability. In July, it took more than two hours for SMRT to restore services to the East-West and North-South lines after both lines were knocked out by a power fault. Apart from upgrading its rail infrastructure and assets, the operator is also beefing up its technical staff. It has 328 engineers as of last month, up 86 per cent from 176 in December 2011. The number of technicians has gone up from 1,728 to 2,224, or by 29 per cent, over the same period. Mr Kuek said rail reliability is improving, pointing out that the average number of disruptions lasting more than five minutes for every 100,000km travelled is now 0.7. This is down from a high of 1.8 in 2011. "We're working hard on all fronts and are determined to bring about a level of reliability and service excellence for commuters that is in keeping with the best in class in the world," said Mr Kuek. National University of Singapore transport researcher Lee Der Horng said the latest centre was a positive development. "With everything under the same roof, there will be better coordination. During breakdowns and emergencies, timely coordination between parties is very important," he said.